To setup your Outlook program on your upgraded Exchange account requires you to back up your rules and personal distribution lists. Complete this before the migration begins. You must also configure your Outlook program after the upgrade and BEFORE using Outlook again. When you are using the Control Panel is in the classic layout, you should see the Mail applet directly in the list of icons. For a 64-bit version of Windows Vista, the icon would be listed in the “View 32-bit Control Panel Items” section. 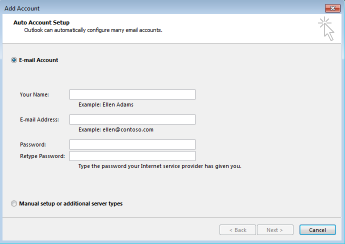 The screen that appears will allow you to setup your SureMail™ account automatically. On this screen you should enter your name, your email address and your SureMail™ password. A message will appear asking you to Allow this website to configure server settings? Select Don't ask me about this website again checkbox and then click Allow. Outlook should now ask for your password again. Put in your SureMail™ password and click Save Password. If you just want to recreate your mail profile instead of adding a new one you can configure it to use your newly created profile as the default by selecting “Always use this profile” and select your new profile. Note: To switch between Mail Profiles, you must close and restart Outlook. It is not possible to to switch between Mail Profiles when Outlook is running. If upon restarting Outlook you won’t get prompted to select a mail profile, it could be that you have Outlook shutdown issues.